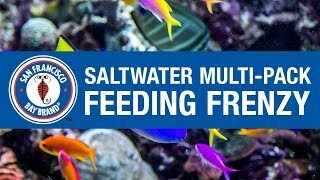 Feed your fish, corals, and invertebrates a variety of quality foods. Reef Multi-Pack is everything you need to feed your reef in one package. 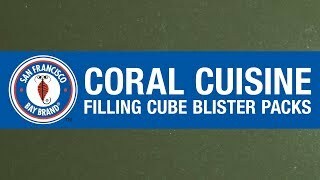 It contains six cubes each of Marine Cuisine™, Coral Cuisine™, Fish Eggs and Reef Plankton. These four foods offer a variety of particle sizes and seven types of zooplankton that stimulate the natural feeding behaviors of reef inhabitants. Reef Multi-Pack is an excellent choice for feeding mixed reef aquariums. The Reef Multi-Pack is recommended for a variety of inhabitants, including: LPS coral, SPS coral, soft corals, gorgonians, polyps, mushrooms, sea fans, anemones, clams, shrimp, anthias, butterfly fish, clownfish, gobies, mandarins, pygmy angels, wrasses, chromis and many more. San Francisco Bay Brand is committed to providing the tropical fish hobbyist, hatcheries, zoos, aquariums, and aquaculture consumers with the highest quality all natural nutritional diets that provide the complete essential nutrients found in your pet`s natural habitats. San Francisco Bay Brand, Inc is owned and operated by the Schmidt family, headed by Andreas who is a second-generation owner with more than 20 years experience in the aquarium fish food and aquaculture business.